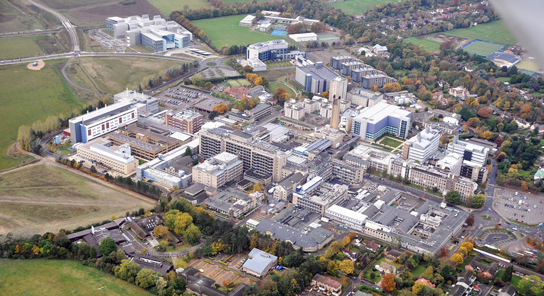 Clinical trials in Cambridge are coordinated by the Cambridge Cancer Trials Centre (CCTC). The CCTC is a collaboration of Cancer Research UK, the University of Cambridge and Cambridge University Hospitals (CUH). The CCTC aims to improve the outcome for patients with cancer, or people who are at risk of developing cancer by designing and conducting clinical trials and studies involving new treatments. The CCTC is located in S4 at Addenbrooke’s hospital. It accommodates around 100 research staff who are involved in the set-up, co-ordination and conduct of clinical and translational cancer research. The CCTC is led by its director, Professor Duncan Jodrell (Professor of Cancer Therapeutics, University of Cambridge). 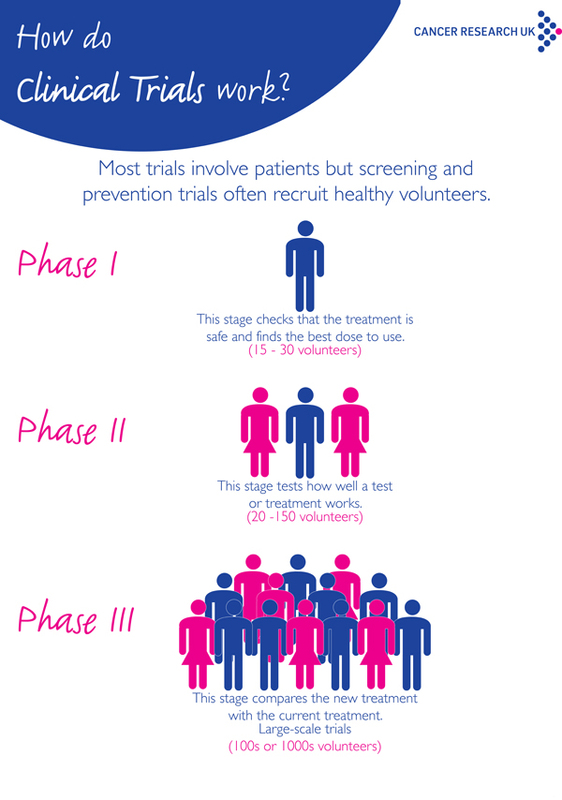 Clinical trials are divided into different stages, called phases. The earliest phase trials (phases 0-1) may look at whether a drug is safe or the side effects it causes. For further information on early phase trials please follow link at bottom of page. Late phase trials (phases 2 – 4) aim to test whether a new treatment is better than existing treatments. Most trials are just one phase but some trials cover more than one phase. For example phase 2/3 trials. If the results of the phase 2 trial shows that a new treatment may be as good as existing treatment, or better, it then moves into phase 3. •	A new way of giving radiotherapy with the standard way. These trials usually involved many more patients than phase 1 or 2. This is due to the differences in success rates may be small and so the trial needs many patients to be able to show the difference. Sometimes phase 3 trials involve thousands of patients in many different hospitals and even in different countries. Most phase 3 trials, and some phase 2 trials, are randomised. Randomised control trials are studies in which a number of similar patients are randomly assigned to 2 (or more) groups to test a specific drug, treatment or other intervention. One group (the experimental group) has the intervention being tested; the other (the control group) has the standard intervention, a dummy intervention (placebo) or no intervention at all. Outcomes are measured at specific times and any difference in response between the groups is assessed statistically. •	How well the drug works when it is used more widely. Approximately 2000 people participate in clinical trials run by CCTC every year. Patients are referred to Cambridge from all across East Anglia. Within the CCTC is the participation team, which is responsible for the care of the patient taking part, or thinking about taking part in clinical trials at Addenbrooke’s . If you are a patient and want to know more about late phase trials relevant to you, please click on the relevant treatment site in the blue tabs above. All information regarding each type of cancer has been found on Cancer Research UK. How do I get referred for a late phase trial? 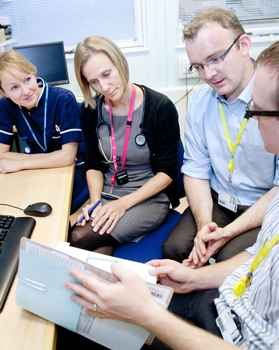 If you want to come to Cambridge and have a discussion about a particular trial, or find out if there is one suitable for you, or what trials may be available in the future, you will need to have a referral letter from your oncologist. Once the referral letter has been received by one of our Consultants, we would plan to see you in one of our clinics within two to three weeks.